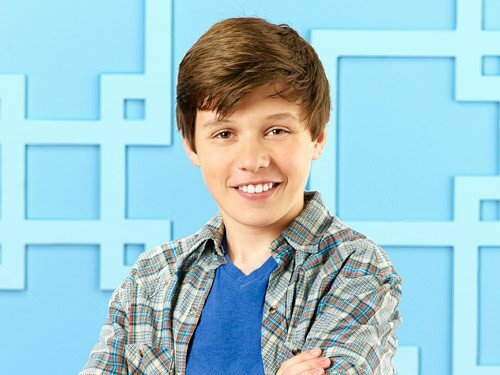 At just the young age of 16, Nick Robinson has already made a name for himself in his debut role on ABC Family’s Melissa and Joey. The young actor’s zingy one-liners and quick wit have made his character Ryder, loveable and throughly entertaining to watch. Melissa and Joey follows the adventures of Melissa Burke (Melissa Joan Hart), a local politician who has to take care of her niece Lennox (Taylor Spreitler) and nephew Ryder (Robinson) after a scandal lands their mother in prison and father on the run. She hires a male nanny, or “manny,” named Joe Longo (Joey Lawrence) to take care of the kids while she is working. Joe was originally part of Melissa’s brother-in-law’s company before the scandal forced it to close and landed Joe out of a job, causing him to pick up the “manny” position. “It’s really about our struggle of getting to know each other in this new environment and then Ryder’s trying to juggle everything else like school and girls and all the normal problems that a teenager faces,” Robinson said. Originally involved in theater, Robinson first heard about the role from his agent in Los Angeles. So far, he has had an absolute blast. When Robinson first got the acting job, he was having trouble traveling from his hometown in Seattle (where he went to school) to Los Angeles for work. While he was able to finish ninth grade, he had to take online classes after that. He does have plans to go back to a regular school in the fall though. Some might expect a major popularity change when one gets a gig on a television show, but Robinson really noticed a big change. More people at his school in Seattle seem to recognize him, but when he’s in Los Angeles, he doesn’t notice much of a difference. Robinson told us that while he does plan on sticking to acting once he finishes high school, he would also like to try other areas of film, such as writing, directing and producing. His role on Melissa and Joey is pretty small but he’s made a big impact on the show’s success. The news came as a big surprise to him and to this day, it is still a little surreal for the young actor. When the show was on hiatus, Robinson worked on a Disney Channel TV movie called Frenemies. He couldn’t really give me much detail on the film other than it’ll be released in 2012. Melissa and Joey will return for the second half of its first season on June 29th.